MOUNTAIN VIEW, Calif. – April 25, 2014 – Speck, the leading designer of award-winning, mighty slim protective cases and covers for smartphones, tablets and laptops, today announced CandyShell AMPED, a new sound amplification case that more than doubles the volume output on an iPhone 5/5s. Natural audio engineering is built right into the interior of the case so it does not use any cables or external speakers, and requires no extra power to amplify your phone’s sound. CandyShell AMPED makes it easy to spontaneously share music, videos, GPS directions, podcasts, and more. It’s also great for speakerphone calls, and because of its acoustic design, there is no need to sync Bluetooth, fumble with extra parts, nor worry about battery drain. CandyShell AMPED, using patent pending licensed technology developed by FISH Innovation, uses an advanced acoustic technology that channels sound waves through a horn shape to amplify and equalize the iPhone sound output. The result is clearer sound that enhances and maximizes the full frequency range. It also minimizes distortion, making voice and music richer and fuller. CandyShell AMPED delivers all the military-grade protection for which the Speck CandyShell is known. It’s a sleek dual-layer case that features a hard outer shell to guard against impact and a soft, rubbery interior to absorb shock from bumps and drops. It also features a raised bezel to protect the screen and rubberized covers to shield buttons. At the bottom of the case, the microphone has a grill cover to protect it, yet allows normal functionality. 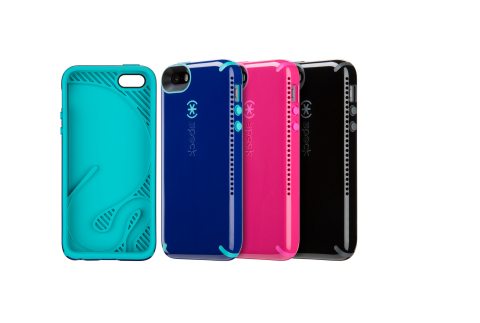 CandyShell AMPED cases are available in a collection of three new Spring colors. They will be available for $44.95 at www.speckproducts.com. And we’re obsessed with creating a more perfect union between humans and machines. That’s why we design award-winning, proven-protective cases for mobile devices, including smartphones, tablets and MacBooks that are bold, not bulky. That’s why we insist on designing every case in-house and lab testing our products down to the details, often against rigorous military-grade standards. And that’s why we hold patents on functional innovations that enhance the relationship between you and your devices—all without sacrificing protection or style. Since 2001, Speck has created cases with sleek lines, radiant colors, and military-grade protection that make your devices live longer: LONG LIVE THE MACHINES™. Get to know us at speckproducts.com or follow us on Twitter, Facebook, Instagram, and Pinterest.